John and I sat in the front/main splash zone, followed by Charlie (11) and Patrick (13), with Finn behind Patrick, and Henry hunkered down in the middle of the raft for fear of getting launched out! In the gallery of photos, you'll notice his little blue helmet way down low, right in between my and John's knees. I started calling Henry "the turtle" because he was very effective at ducking down so low that the bill of his hat was sitting right on top of his life vest's shoulders. He stayed that way most of the trip, as we shot through the Zoom Flume, The Widowmaker, and the Devil's Toiletbowl. At some point I did hear him laughing, and looked over and saw his face plastered with a wide grin. He admitted at the end that he really had fun and would definitely do it again (as would all the other boys!). Brown's Canyon is the newest National Monument, and boy was it scenic. 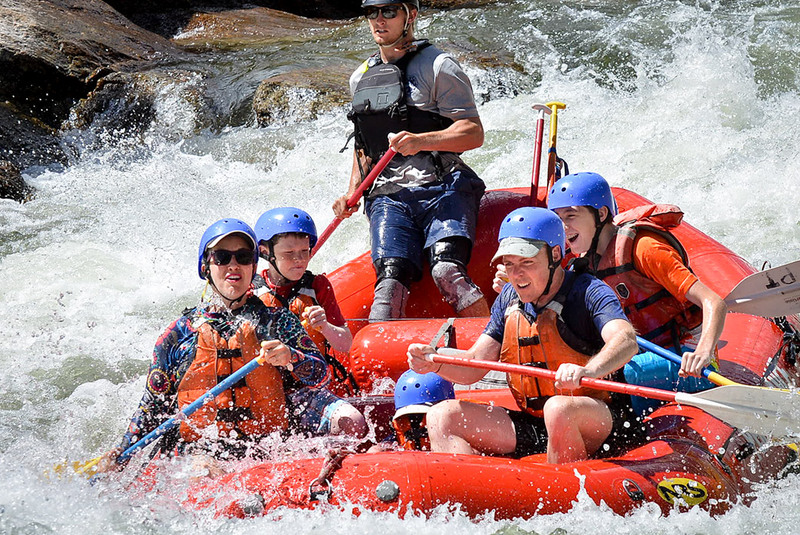 We had an epic adventure, and we were thrilled to chaperone all the kids on their first rafting trip. The Arkansas river will definitely see more of us in the future!